Music show bookers in Bushwick are certainly not taking a summer break. 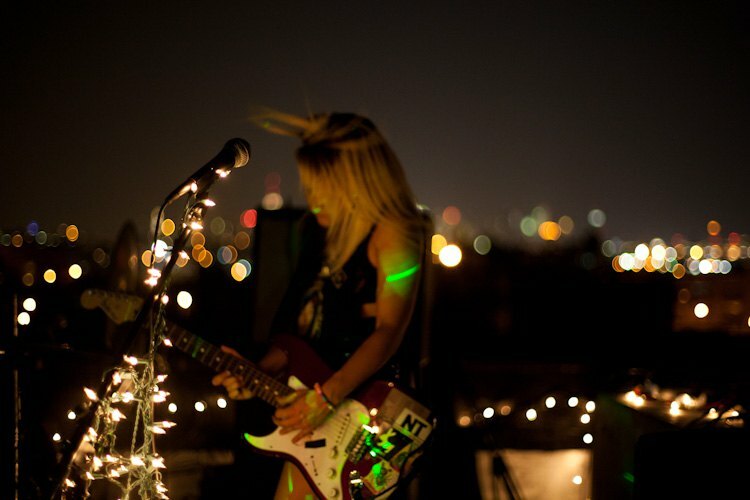 To the contrary, the bands are playing everywhere: on a roof, in a storage, in a backyard, in a loft and more! Spice Hound Music Co. is releasing a CD! To celebrate this occasion they will play a show at a warehouse at 338 Moffat Street off Wilson L. They invited The Hybrid Movement Company acrobats, The End Men, Cave Days and The Sewing Machine War to help them entertain the crowd! Is there anybody cooler than aerialists? Maybe really good magicians... Or decadent dancers. Either way, all of these performers will be providing for your decadent experience this Thursday at The House of Yes. Tix are 10 bucs a piece and are sold exclusively at the door. Yes, you've heard it from us, but REALLY... Go to Delinquency. The place is great, the bands are amazing, they have FREE BOOZE all night. Do I have to add anything else? All they are suggesting is a donation of $10. A bunch of folks from 1085 Willoughby are inviting you to another show on their roof. They are starting at 5PM, and will be grilling, chilling, listening to bands (The Initials, Garage Sail) and enjoying some improv (Mike Green, Scott Townsend and Randy Riback, Pushups, Teen Demon). They are saying you should BYOB and BYOM (meat for grill), otherwise the event is free, organized simply for the love of roofs and fun! Do you know the Cheap Storage building on Wyckoff Ave right off Jefferson L? Yes, that one. Go there and experience some storage awesomeness with Avan Lavan, Osekre and The Lucky Bastards, Gunfight!, Life Size Maps, Gypsy Wig and DJ Collective Wc Kids. Tix are $7 in advance or $10 at the door. The 60 minutes between 8PM and 9PM is fully dedicated to free beer drinking, so come early! English rock singer Peter Murphy who used to be in bands such as Bau Haus or Dalis Car is coming to Bushwick. Yes. It is true. Come to The Well on Sunday at 5PM. $25 to let you in.